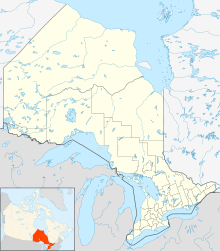 Sioux Lookout Airport (IATA: YXL, ICAO: CYXL) is a regional airport based in Sioux Lookout, Ontario, Canada. The airport opened in 1933. It was, at the time, the second busiest airport in North America next to Chicago Midway International Airport. Today, the airport is a "mini-hub" facilitating travel to and from many northern communities in Northwestern Ontario. Ornge Air operating Pilatus PC-12 aircraft in Medevac configuration. SkyCare Air Ambulance operating Medevac and charter operations. Northern Skies Air Service operating charters with Piper Chieftains. Slate Falls Airways scheduled and charter services. Past three hours METARs, SPECI and current TAFs for Sioux Lookout Airport from Nav Canada as available. This article about an airport in Ontario is a stub. You can help Wikipedia by expanding it. This page was last edited on 25 March 2019, at 15:38 (UTC).